The assistance systems in the Audi A5 model series use a variety of technologies to make driving even more controlled. Some of them have been improved with new functions. Among the standard features is the new driver information system with recommendations to take a break. It uses steering motions and additional parameters to detect when the driver is getting tired and issues an appropriate warning. Audi side assist supports the driver when changing lanes by using radar to monitor the space behind the car. Audi active lane assist - a new feature in the Audi A5 - helps the driver to maintain the lane. A camera detects the lane markings and the system makes slight corrections to the electromechanical steering, if necessary. 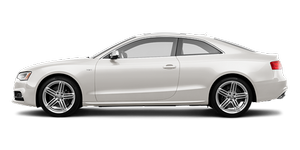 The adaptive cruise control uses radar technology to maintain a constant interval between the Audi A5 and the vehicle ahead. At speeds below 30 km/h (18.64 mph), it initiates maximum braking in the event of an impending collision.